Commonly referred to as the collarbone, the clavicle is a bone between the ribcage and shoulder blade that connects the arm to the body. 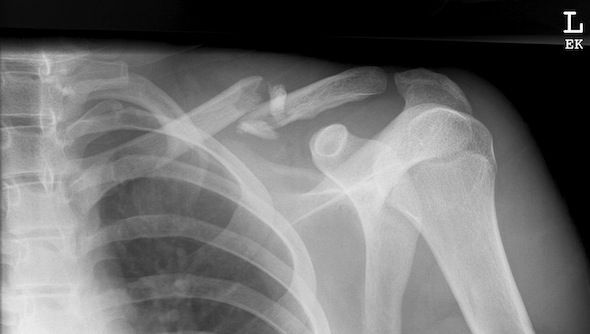 A fractured clavicle, or a broken collarbone, often occurs due to slip and fall accidents, car accidents, motorcycle accidents, work injuries, or during sports. If you have broken your collarbone, there are different options for treatment depending on how bad the fracture is. After your doctor examines you and runs an x-ray, he or she will either decide on nonsurgical or surgical treatment. If the broken ends of the bones did not shift out of place and still line up correctly, often called a “clean break," you may not need surgery. Your doctor will most likely give you a simple arm sling to support your arm and keep it still while your collarbone heals, prescribe medication, and assign physical therapy. Unfortunately, it is not impossible for your bones to shift as you heal. You will need to see your doctor regularly as your fracture heals, to check on the bone’s progress and to determine whether you need surgery if shifting occurs. However, if your bones are out of place, or displaced, your doctor will recommend surgery. Surgery will place the bones where they are meant to be so that they will heal. There are two different types of surgeries that will accomplish this: plates and screws or pins. During a plates and screws operation, the bone fragments are repositioned into their normal alignment and then held in place with special screws or by attaching metal plates to the surface of the bone. These are not usually removed after the bone is healed. Pins are also used to hold the fracture in a good position so that the bones may heal, but are usually removed once the fracture has healed. If you have suffered a broken clavicle due to a work injury, you may be entitled to compensation. New Jersey is a no-fault state, so even if your accident was your fault you are covered by workers’ compensation. Manfred F. Ricciardelli, Jr. has been representing injured workers for over twenty years. He will help determine the best course of action for your case and make sure that you receive the benefits you deserve. For a free consultation, call us today at (973) 285-1100, or fill out our online contact form.